Newland Communities’ Annual Pumpkin Festival will be held on Saturday, October 15, from 3-8 p.m. in Starling Ranch off of FishHawk Blvd. Newland Communities’ annual Pumpkin Festival is just around the corner, being held on Saturday, October 15, from 3-8 p.m. The gourd gala will be held in the same location as last year – 15800 Starling Crossing Dr. – in FishHawk Ranch’s newest neighborhood Starling on the North Side of FishHawk Blvd., explained Lynda McMorrow, marketing manager for Newland Communities’ FishHawk Ranch and MiraBay communities. This location is also the future site for the Starling Club, which will be another amenity for FishHawk Ranch Residents in the future. “Pumpkin carving starts at 9 a.m. and goes until the last pumpkin is carved,” she said. At which point, the pumpkin lighting ceremony will take place at 8 p.m.
Last year saw close to 8,000 residents carving pumpkins. This year, McMorrow is hoping for at least that many participants and is prepared with more than 500 pumpkins available to be cut, carved, etched and scraped. The charities this year are Feeding America Tampa Bay and the Y. “We’re encouraging everyone to bring non-perishable food items to the Feeding America tent during the Festival,” McMorrow said. Tickets for games, hay rides, face painting and more will be available for cash purchase beginning at 2:30 p.m. for games and activities from 3-7:30 p.m.
Local businesses and vendors will host a Treat Street from 3-6 p.m., including the Osprey Observer’s O.K. Cookie Corral. “There were close to 50 booths last year,” McMorrow said. Food and drink will be available for cash purchase from 3-8 p.m. Fifty percent of all sales will be donated to the Y and Feeding America Tampa Bay. 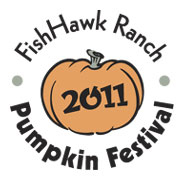 The first ever Pumpkin Festival Tennis Tournament will take place from 10 a.m.-2 p.m. at the FishHawk Ranch Tennis Club located in Starling. Teams will consist of one adult and one child. There will also be a pie eating contest and “we may throw in another new contest on stage,” McMorrow hinted. At the end of a fun-filled day, a free concert given by The Go Daddies will take place from 5-8 p.m.
Newland is asking that pets remain at home for this event. But, they will be welcome on Sunday, October 16, in the same spot for the Dog Fest event. For Pumpkin Festival information, please call 681-4000 or visit thepumpkinsarecoming.com for updates and the volunteer application. For donation opportunities, contact McMorrow directly by e-mail at McMorrow@newlandco.com.